BJT operation modes are at cut-off, saturation and active or linear. At cut-off, simply the BJT is not operating, say the base-emitter voltage requirement is not meet. The corresponding collector-emitter voltage is the same with the collector supply. At saturation the other hand, the BJT is driven into the point wherein its collector current can no longer increase despite of the increase in the base current. In this mode, the collector current is no longer dependent on the device current amplification factor or commonly known as beta. In active or linear operation, the collector-emitter voltage of the transistor is higher than the saturation voltage but less then the collector supply voltage. In active or linear operation also, the collector current is dependent to the base current and current amplification factor of the transistor or beta. Let us consider above circuit to explain well the BJT operation modes. When the VBB level is less than the base-emitter voltage requirement of the device, the transistor will operate at cutoff and the voltage measured across collector-emitter terminals is equal to the level of VCC. Nowadays, BJT VBE is ranging from 0.5V to 1.2V maximum with a typical value of 0.7 for a silicon made transistor. At cut-off condition, it is very important to take note the collector-emitter voltage of the transistor. The specified level on the datasheet must not be exceeded. This is the VCEo rating when you look at the datasheet; a short for collector-emitter voltage with the base open. Below figure is a sample VCEo specification in the datasheet. In this equation we assume that Ic and Ie are equal since the operation is saturation and the level of VCEsat is very small that can be neglected. This means that the collector current will increase with the increase of the base current or decrease with the decrease of the base current considering the beta is a stable value. The collector-emitter voltage is higher than the VCEsat but less than the collector supply level. On the three BJT operation modes, cut-off is actually very easy to attain. Just remove the bias of the base. However, saturation and linear should be designed very well to move one another away. Do not put the operation in the boundary to avoid design issues. For applications like switch (simple connect and disconnect) and switching converters the BJT operation modes used are cut-off and saturation. To know more about how to drive a transistor into saturation or how to know if a transistor is saturated, read this. 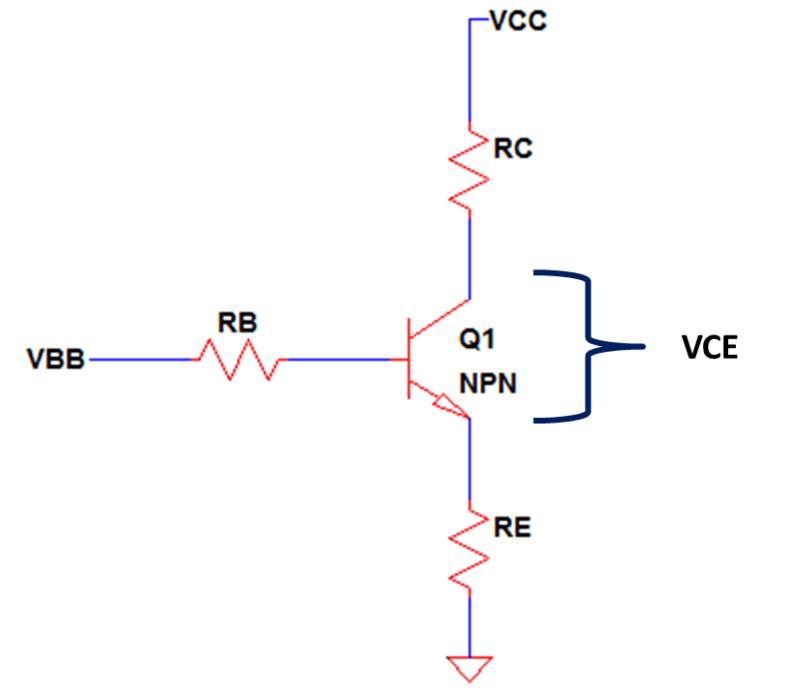 To know the factors to be considered in selecting a transistor, click here.